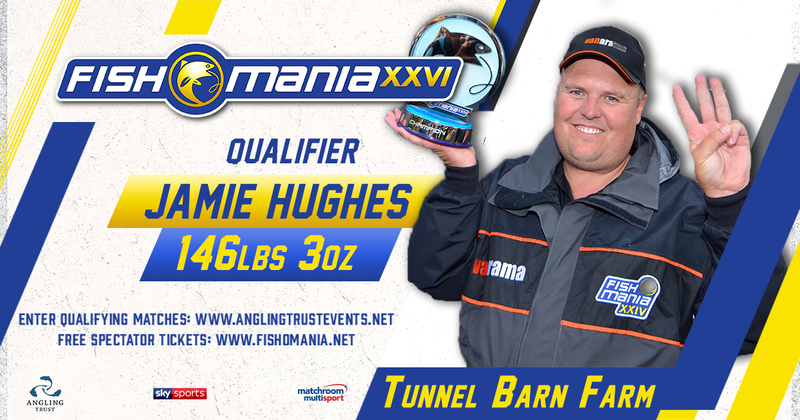 Tunnel Barn Farm had another sell-out qualifier for Fish’O’Mania XXVI and with some mild and windy conditions, it was expected a few good weights would rear their heads. There was a real atmosphere at the draw, helped by the fact that the winner could come from almost any lake and it was certainly an unfavoured peg that took the honours. The angler on the fated peg however, was a certain Jamie Hughes who needs no introduction! Jamie got his F1s going short on maggot, getting through four pints in the five hours and fishing relatively light gear, with 0.1 hooklength and size 18 Bagger hook. At the weigh in the scales settled on 146lb 3oz, which was over 13lb clear of the chasing pack. This will be ninth final that Jamie has qualified for and you certainly wouldn’t bet against the man making it four times! The ever-consistent Ryan Lidgard took second spot from House Pool peg 24, with an impressive 132lb 5oz. Akin to Most Ryan also took his fish on Maggot short, with around 50 F1s to 4lb. This will be back to back finals for Ryan, so can he get that all important draw and take the honours? Third on the day was another man no stranger to Fish’O’Mania final, Steve Cooke, who qualified from this match last year! Steve was also on House pool peg 4 and weighed in 127lb 4oz. Steve also fished short to get good presentation in the strong wind and caught mainly on red maggot. A huge thanks to Sarah and Joe at Tunnel Barn Farm for another incredibly well-prepared qualifier and to Mike Storey for organising. We move westwards for the next two qualifiers at Woodlands View and Moorlands Farm and make sure you visit the booking site to guarantee a ticket.